Mahesh Ghate, founder of Shepherds of Himalayas, speaks to us about his passion for their way of life and how their practices can ensure the future environmental longevity. 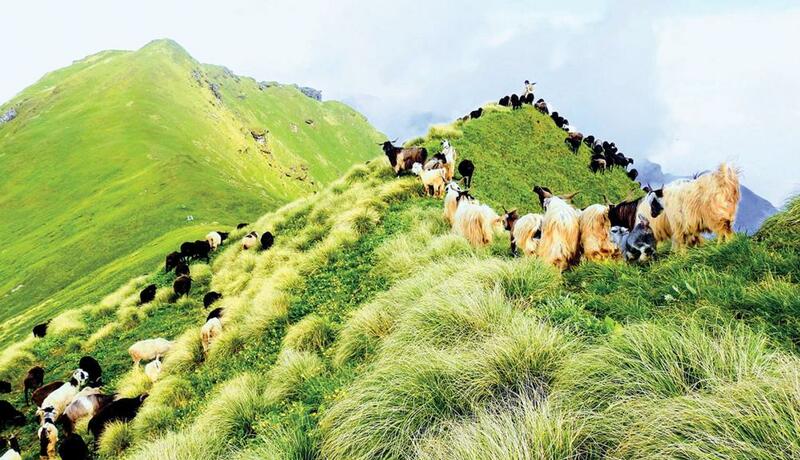 "Being born and brought up in Wani, a small town in the state of Maharashtra, I have always been intrigued by the nomadic sheep herders in my region who used to migrate following monsoon rains. I am a mechanical engineer by profession, but I have an affinity for writing about the Himalayan landscape and its people. We have learned there is so much knowledge the shepherds have about these alpine meadows, which can be saved by utilising their lifelong experiences and scientific management. The roots of shepherding practice in these parts of Himalayas are still intact from generations where shepherds follow footsteps of their forefathers. They tend their sheep and goats in valleys in winter using fodder available in the nearby forest as well as from farms. With the glimmer of warm, sunny days typically in the end of March, they collect they collect their sheep and goats and head towards alpine meadows following trails blazed by their forefathers in search of better grazing pasture. On the route, they stay at stone huts used from generations or set up temporary camps on various locations, taking advantage of fresh grass and foliage biding their time to reach the alpine meadows in mid-May when there will be plenty of grass for grazing. The use of modern facilities, such as solar panels, mobile phones, sleeping bags and plastic tarpaulins has made the life bit easier, but challenges thrown by Himalayan landscape are ever-present. We are currently working with sheep herders of the Mandal valley who migrate to the alpine meadows of Rudranath in the Western Himalayas. The topography of these regions is characterised by undulating terrain interspersed with rocky hills, and the elevation ranges from 1,500-3,500 metres (4,920-11,480ft) above sea level. The year is typically represented by three main seasons in this region – a cool and relatively dry winter (December to March); a warm and dry summer (mid-April to June); and the monsoon season, a wet period from July to mid-September. The climate is harsh with low temperatures, fluctuating atmospheric pressure, blizzards and hailstorms prevailing for all but a few months of the year. The biggest problem is the uncertain and harsh weather conditions, which affects grazing and their schedules for the journey. Epidemics of foot-and-mouth and pneumonia are caused by too much rain, and food poisoning also becomes an issue if the sheep consume certain grasses. The men take care of sheep herding, spending most the months away from home in search of better pasture for their herd, while the women take care of home and family in their native villages. They are also responsible for the collection of fodder and hay for upcoming winter months to feed and it’s hard work. The future here is uncertain. Traditionally, the sheep herd is passed on from father to their sons, with an equal division of sheep among them. The children, at a very young age, used to join their father, helping them in shepherding simultaneously learning tricks of the trade. But nowadays, shepherds don’t want their children to practice sheep herding due to severe hardships without much financial gain." The seeds of Shepherds of Himalayas were sown back in 2016 when I was working as a volunteer with my primatologist friend Himani Nautiyal (a collaborator in this project) at Rudranath. We were investigating the grazing pressure from the sheep present on the alpine meadows as well as effects of climate change on this landscape. During this period, we spent considerable time interacting with sheep herders about their life, cultural traditions, their gods and beliefs, their knowledge of the forest and its resources, challenges they face in this landscape, conflict with wild animals, sheep herding traditions and practices. So our project was born and we aim to apply research across all Himalayan landscape in India and learn about the shepherds by staying with them when we can.